The first job is done and done well. The priority this year is finishing top four and qualifying for the Olympics. The Canadian women's 7s squad got a good jump on that goal finishing 3rd at stop #1 in Glendale, Colorado. Next up is Dubai in 6 weeks, then Sydney in February, the dreaded Kitakyushu in Japan in April where Canada stumbled last season, then home cooking in Langford in May before the final tournament in Paris in June. If Canada can keep this pace it should be all smiling faces come June. Canada breezed through Day 1 with a particularly satisfying win over the French who nudged them out of 3rd last season. Day 2 started with a stern test against Russia where Charity Williams stood tall with two tries. Canada got NZ, the eventual winners, in the semis unfortunately, there only loss in the tournament. After that they thumped the French for a second time just for an exclamation mark in the 3rd/4th match. It was a satisfying tournament for Canadian fans, coaches and players and put to rest any speculation about the team's ability to return to former playing levels. The USA were surprise 2nd place finishers to NZ and defending Olympic champions Australia would be the most disappointed with their 5th place finish. 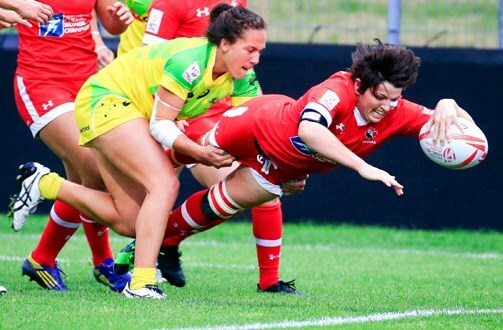 Caroline Crossley scored the opening try of the season for Canada as her side cruised to a 26-7 victory over Fiji to open day one. Julia Greenshields and Charity Williams - celebrating her 22nd birthday - also dotted down for tries, while Captain Ghislaine Landry added one score and three conversions in the win. With the 11 points Landry now sits only five points shy of becoming the first female to record 1000 on the HSBC World Rugby Women's Sevens Series. Coach John Tait's side closed out day one with a clinical 24-10 victory over France. Brittany Benn, Caroline Crossley, Bianca Farella and captain Ghislaine Landry each scored tries, while Landry made history by becoming the first-ever female player to record 1,000 points on the World Series. 9. Ghislaine Landry, Captain, Toronto Scottish (Toronto, ON) ? It's an interesting juxtaposition between the men's and women's 7s programs right now. The women are starting their campaign to qualify for the Olympics on Saturday, the men are still on strike action waiting for Rugby Canada to modify their offer. The women's 7s program has largely been left alone by the Rugby Canada bureaucrats to evolve, grow and operate by Canadian standards. The men's program has been affected by World Rugby money and politics. The latest has been the plan to merge the men's XVs and 7s programs to have a common pool of players. This plan includes taking money from the 7s players to help pay the XVs players. Imagine if John Tait came back from Colorado on Monday and found out that XVs coach Sandro Fiorino, was now responsible for selecting the carded players for both programs and that the teams were going to be practicing together so the XVs program could select the best 7s players to help them compete. We laugh, but that's what's happening in the men's program. We'll leave that issue for now to focus on the women. The women's program hasn't really been the same since Jen Kish left, that's our impression. Her contribution was huge, the team faltered in their results since that time, hitting a low spot in Japan where they finished near the bottom of the tournament. They were edged by France and lost their traditional 3rd spot, Olympic Bronze position, in the World Series last year. At the World Cup they stumbled and finished well down from their Olympic Bronze standing. So this weekend will be interesting, they're in a pool with Fiji, Ireland and France. This weekend will reveal a lot about the team's 2020 Olympic aspirations, and how they've recuperated post Jen Kish. We wish them the best. Kick off for Canada is 9:30am PT, live streamed by CBC Sports. GLENDALE, COLORADO (October 17, 2018) – Canada women’s sevens head coach John Tait has named his starting roster to kick off the 2018-19 HSBC World Rugby Women’s Sevens Series this weekend in Colorado. Led by captain Ghislaine Landry, who holds the all-time record as the highest women’s points scorer with 984, Tait’s roster includes a wealth of experience as all 13 names have prior caps on the series. With all eyes on qualifying for the Summer Olympics in Tokyo in 2020, Canada will look to build on last year’s 4th place finish by starting the season off with a podium appearance, something that has been missing in recent years. BK – John, there’s been a lot of moving parts lately in the NSW7s with France (Training Camp), Japan (Maple Leafs), Buenos Aires (Youth Olympic Games). What's the latest update? JT – It’s been challenging for the all players and staff to have these lead up tournaments and camps in France these past few weeks leading into Denver, but critical for us to get everyone playing, competing and match ready for the Youth Olympics and more importantly this first series stop in the Olympic qualifying season. BK – How did the training go in Marcoussis and how did that affect selection for Colorado? JT – The games against Belgium, Ireland & France’s squads gave everyone there an opportunity to perform and contest for this first series selection. I thought some of our younger players really took some steps forward in their consistency of play and it really has made selection more difficult, which is a nice dilemma to have. BK – Thoughts on the USA Women’s Sevens pool? JT – It’s a good pool for us, we know the opposition well and what we need to do to be successful against them, so we can really focus on how we want to play them. Fiji are always dangerous, Ireland have given us some great competition last season and France finished ahead of us last season as well as taking the last game we face them. BK – Obviously, it goes without saying that it's important to start an Olympic qualifying year off strongly, but over the years Canada has more often than not struggled in the first tournament. How are you feeling leading into the season? JT – Last season, I felt at least, was mentally the toughest that we’ve gone through. We had inconsistent results, lots of injuries to our most experienced players and we got away from what our strengths in the past have been. We have had a really honest reflection across the whole program on areas where we all need to be better and now are refocused, excited and ready to take down one of those four automatic Olympic qualifying places from the series.